© British Library Board, Cotton Nero D. VII, folio 7. Daughter of Henry I Beauclerc of England and Matilda of Scotland, wife to Henry V, Holy Roman Emperor, secondly to Geoffrey Plantagenet of Anjou. Eight year old Matilda was sent to Germany to be educated betrothed to Henry V, emperor of Germany. 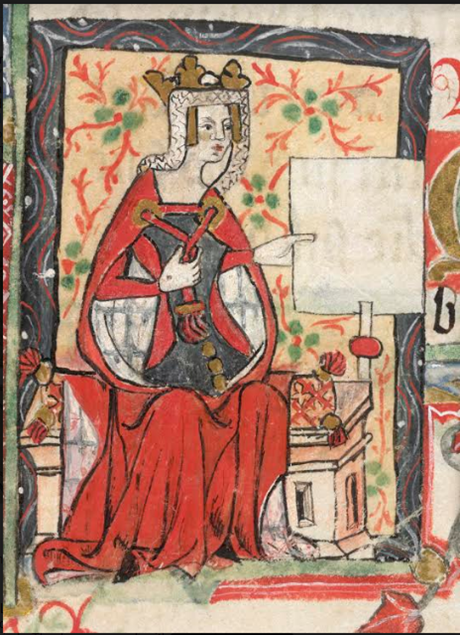 After her first husband’s death in 1125, she returned to her father’s court who, having lost his only son William in 1120, made Matilda his successor. Henry concerned about a woman being accepted as his successor called all his nobles and prelates together more than once to swear fealty to her. With Henry’s guidance Matilda married secondly fifteen year old Geoffrey Plantagenet of Anjou in 1128 and upon her father’s death in 1135 she became the heiress of all his dominions in England and France. Matilda was in Anjou when her father died and her cousin, Stephen, Earl of Blois, took advantage of her delay seizing the crown of England three weeks later. The barons of Normandy submitted to Stephen but his administration soon became unpopular. Hearing of her father’s death Matilda immediately entered Normandy to claim her inheritance but faced opposition from the Norman barons. It took four years for her to gather supporters and in 1139, Matilda invaded England as the supreme commander of the army to claim her throne from the usurper while Geoffrey remained in Normandy to win a heritage there for their young son Henry. In 1141, her forces captured Stephen and Matilda was proclaimed “Lady of the English.” Within a few months her demands for money and quarrels with the Church had soured many of her supporters and hostility mounted to such an extent she was forced to masquerade as a corpse to escape Stephen’s supporters. Eventually Stephen was set free and she was again obliged to elude her would-be captors, this time by wearing white so as to blend with the snow around Oxford Castle. In time the war degenerated into a stalemate with Matilda controlling much of the south-west of England and Stephen the south-east and the Midlands and large parts of the rest of the country were in the hands of local, independent barons. Seal of Empress Matilda, Society of Antiquaries of London, seal cast case A3. “MATILDA.” Foundation for Medieval Genealogy. ENGLAND KINGS 1066-1603, Chapter 1. KINGS OF ENGLAND 1066-1135 (NORMANDY), GUILLAUME de Normandie, HENRY of England, 2. MATILDA. Web 08 October 2016. //fmg.ac/Projects/MedLands/ENGLAND,%20Kings%201066-1603.htm#Stephendied1154B. Richardson, Douglas. Royal Ancestry: A Study in Colonial and Medieval Families. vol. 1 pp 18.3. 2013.